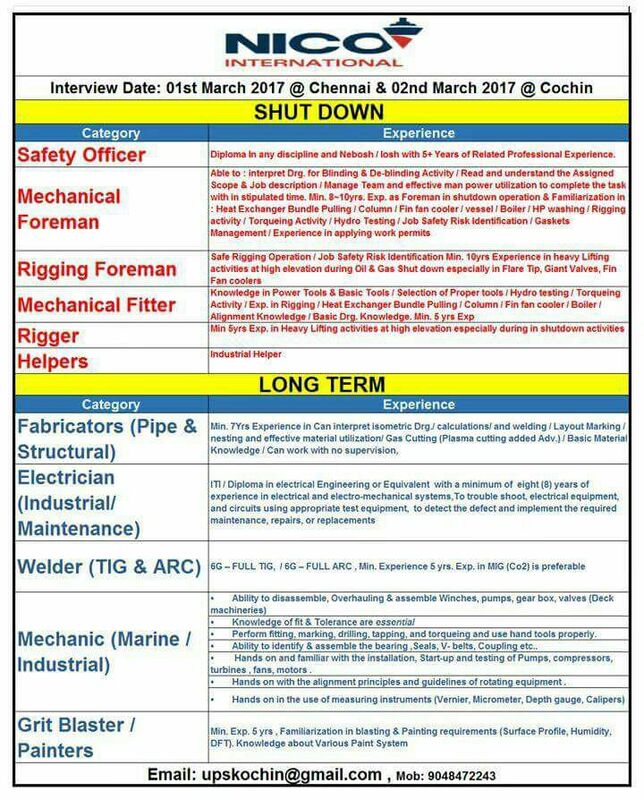 SHUTDOWN JOBS NICC HIGH SALARY: Nico INTERNATIONAL Interview Date: 01st March 2017 a Chennai & 02nd March 2017 Cochin SHUTDOWN Experience Category Diploma in any and Nebosh losh with S. Years of Related Professional Experience. Safety Officer Able to interpret Drg. for Blinding & De-blinding Activity Read and understand the Assigned Scope Job description Manage Team and effective man power utilization to complete the task Mechanical within stipulated time. Min. 8-10yrs. Exp as Foreman in shutdown operation Facilitation in Heat Exchanger Bundle Pulling l Column Fin fan cooler vessel Boiler THP washing Rigging Foreman activity / Torque Activity / Hydro Testing /Job Safety Risk identification Gaskets, Management Experience in applying work permits Safe Rigging operation Job Safety Risk identification Min. 10yrs Experience in heavy Rigging Foreman activities at high elevation during oil Gas Shut down especially in Flare mp, Giant valves Fin Fan coolers Knowledge in Power Tools a Basic Tools selection of Proper. Mechanical Fitter. Activity iExp in Rigging Heat Exchanger Bundle Pulling Column fan cooler Boiler Alignment Knowledge. Basic Drg Knowledge. Mn yrs Exp Industrial Helper. LONG TERM Experience Category Fabricators (Pipe &Min. Yrs Experience in can interpret isometric and welding/ Layout Marking nesting and effective material utilization Gas cutting (Plasma cutting added Basic Material Structural Knowledge / Can work with no supervision, Electrician ITI Diploma in electrical Engineering or Equivalent with a minimum of eight years of experience in electrical and electromechanical systems, To troubleshoot electrical equipment. (Industrial/and circuits using appropriate test equipment, to detect the defect and implement the required maintenance, repairs, or replacements Maintenance) Welder (TIG & ARC) 6G-FULL mo, 6G-FULL Arc, Mun Experience 5 yrs. Exp. in MIG (Co2) is preferable. Ability to disassemble, overhauling & assemble Winches, pumps, gear box, valves (Deck machineries) Tolerance are essential Knowledge Perform fitting, marking drilling tapping, and torque and use hand tools Mechanic (Marine Seals, V. belts, C B assemble the be Hands on and familiar with the installation, Start-up and testing of Pumps compressors, Industrial) turbines fans, motors Hands on with the a principles and guidelines of equipment. Hands on in the use of measuring instruments (Vernier, Micrometer, Depth gauge. Calipers, Grit Blaster Min. Exp 5 yrs Familiarization in blasting & Painting requirements (Surface Profile, Humidity, DFT, Knowledge about various Paint System Painters. Email: [email protected] Mob: 9048472243. Fire&safety diploma from nice Cochin. Completed bass course in singapore.4 years experience related in safety department in oil & petrochemical construction & maintenance field. Fire&safety deploma in nife cochin 2006.bcss course in singapore.4 years experience in safety field in singapore at oil & petrochemical construction & maintenance.plus first aid ,cpr & aed. I HAVE MORE EXPERIENCE IN CIVIL WORK IN INDIA/OMAN/QATAR. I SURCH MASON FOREMAN JOB IN GULF. IF HAVE REQUIREMENT Macthing job for gulf*(civil chargehand/Foreman) please call me.